Log in or register! If you register, be sure to read the rules before joining in the Join/Character Sheets forum. 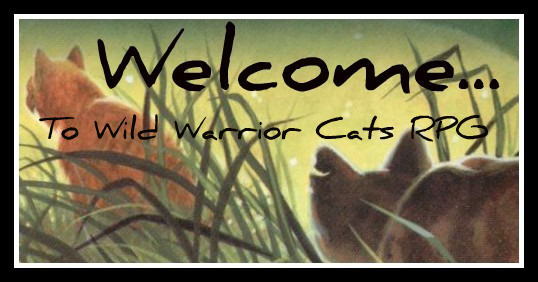 Welcome to the new Wild Warrior Cats RPG! Read the rules and sign up at the Join/Character Sheets forum. And please be on as much as you can. News: One moderator spot left. Sign up in the Announcements forum. The season is Greenleaf (Summer.) The weather is hot and sunny with the occasional rainfall. The prey status is plentiful. Admins may only post here. Adjustments to the rules may be made later on. Helpful information on how to RP here. Only admins and moderators may post here. Read the rules before joining here. Edit your join sheets as need be. Only admins and moderators may post announcements about any new rules. Ask questions and post suggestions for the site here. Anyone may post here. Are you going to be quitting or leaving for some time? Let us know here! Hunting grounds outside of EarthClan camp. Hunting grounds outside of AirClan camp. Hunting grounds outside of WaterClan camp. Hunting grounds outside of FireClan camp. The Gathering place of EarthClan, AirClan, WaterClan, and FireClan. The Clans' medicine cats and leaders visit the Star Crystal to meet with StarClan. Seeking a mate? Click here. Anyone may post here. Chat, play forum games, etc. Be appropriate.